The long stretch of sand is (almost) as flat as a pancake. Small waves crash in the distance and leisurely withdraw from the shore. Beige-colored crabs scurry along, visible one moment, out of sight the next. 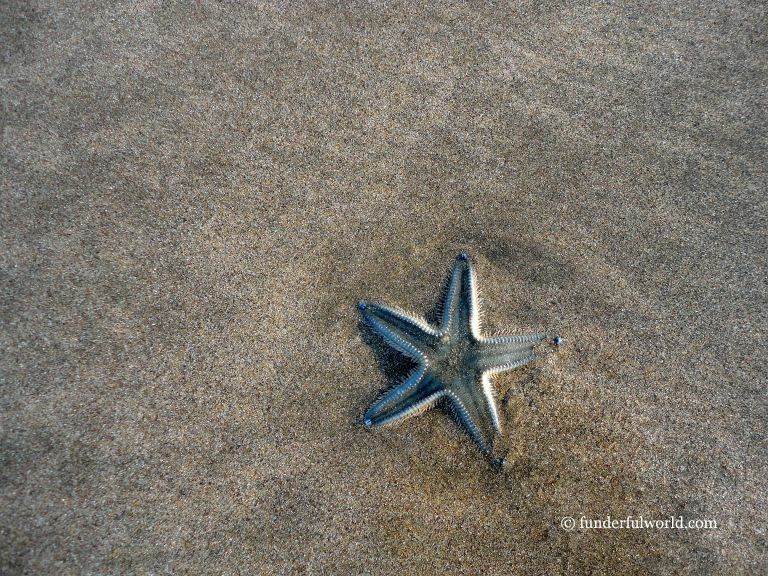 A couple of starfish lie still on the shore. Dozens of hungry plovers dig feverishly into the sand to find their meal. High up in the sky, a sea eagle flies home victoriously, with a struggling serpent held firmly in its talons. Long stretches of flat beaches. Tarkarli, Maharashtra, India. 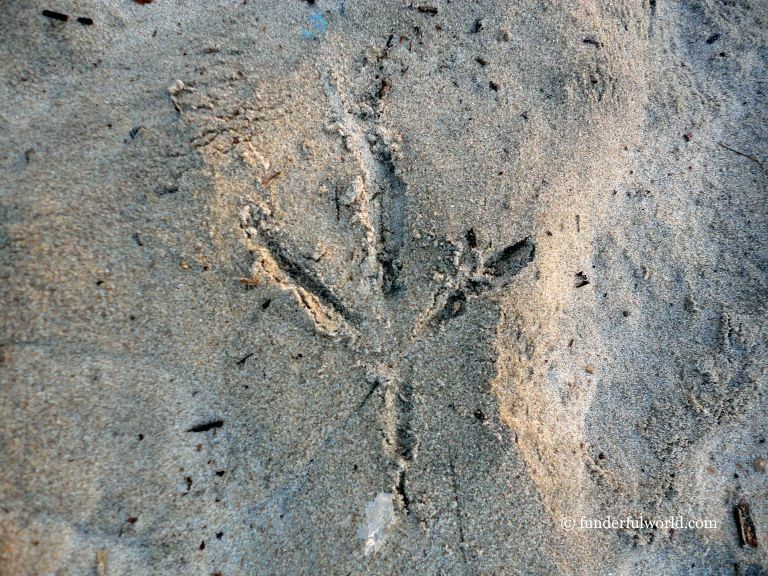 Footprints in the sand. Tarkarli, Maharashtra, India. Who goes there? Tarkarli, Maharashtra, India. Star of the show. Tarkarli, Maharashtra, India. Our sandcastles are ready and on display for the few who walk by. Near the horizon, the sun gets ready to call it a day. In the distance, the strong sea fort begins to appear hazy. My gaze shifts from our small creations in the sand to nature’s spectacular creations in the sky. 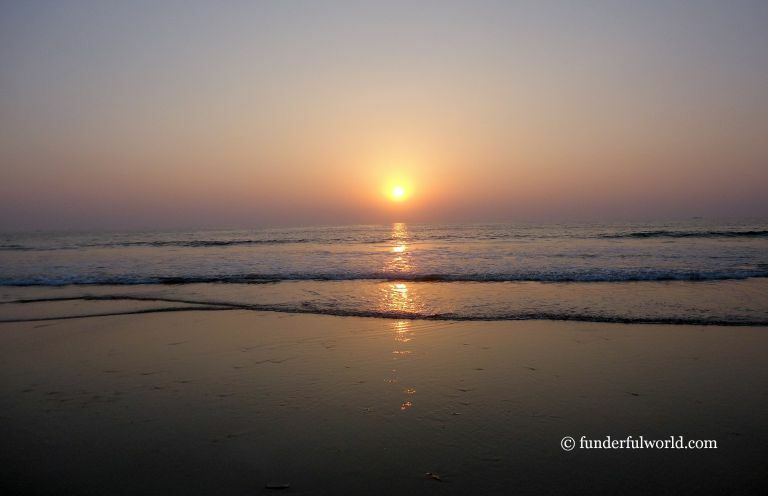 It is almost the end of a day in Tarkarli, a picturesque beach town in south Maharashtra. 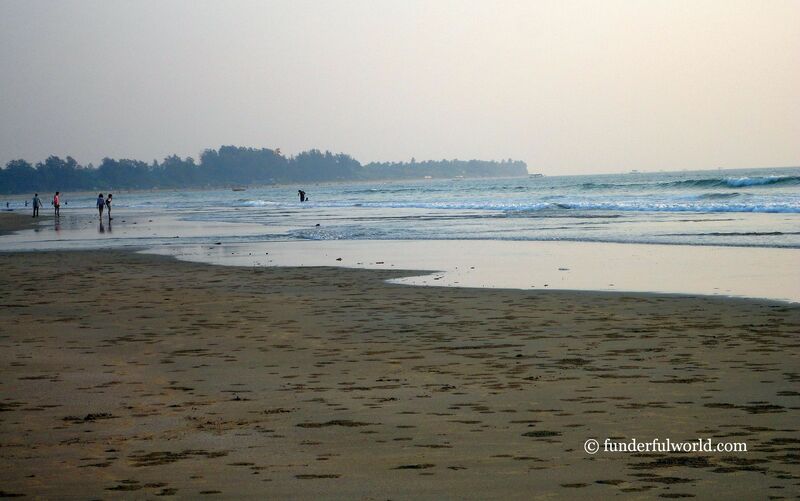 Located in the Sindhudurg district, the seemingly endless stretch of flat silver sand in Tarkarli offers a quiet and beautiful alternative to the more crowded beaches to its north. 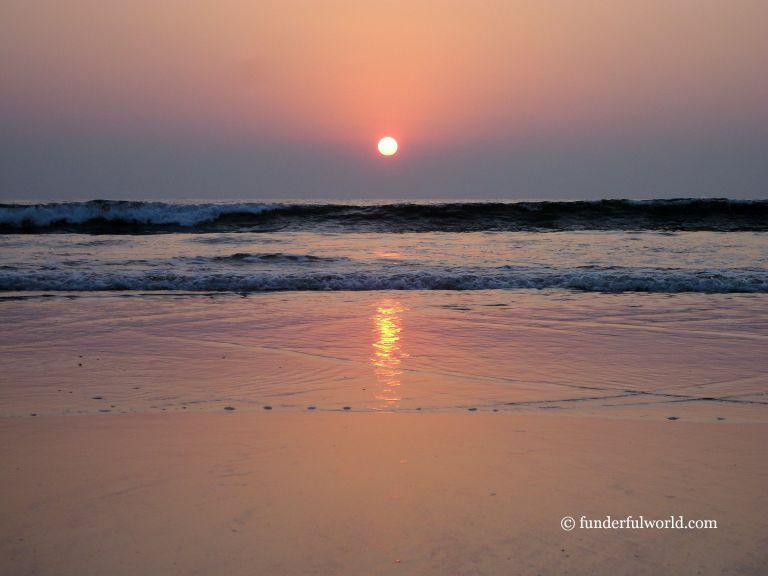 Bordered by Devbaug beach to its south and the majestic Sindhudurg sea fort to its north, Tarkarli is a perfect destination for a tranquil seaside holiday. Sindhudurg in the distance. Tarkarli, Maharashtra, India. Our accommodation opened out onto a beautiful stretch of sand at Waayari Bandh, along the several kilometers of flat beach in Tarkarli. The beach was free of crowds and noise. 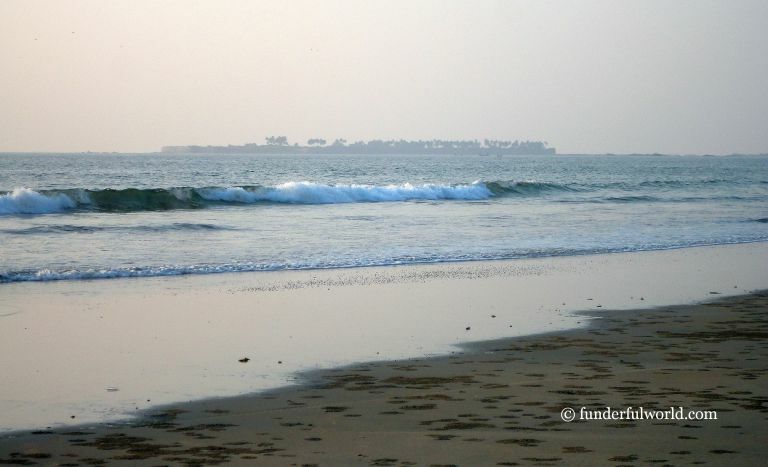 We splashed in the cool waters of the Arabian Sea, walked leisurely along the sands, and inhaled the fresh sea breeze. We designed and built sandcastles, counted crabs and starfish, and sat back to enjoy the pretty sunsets. When it was too hot or too dark on the beach, we swung lazily in hammocks with a book for company. The kids play area at our resort gave Junior another fallback option. View from the balcony. Tarkarli, Maharashtra, India. Time to take a bow. Sunset at Tarkarli, Maharashtra, India. A glorious end to a glorious day. Tarkarli, Maharashtra, India. 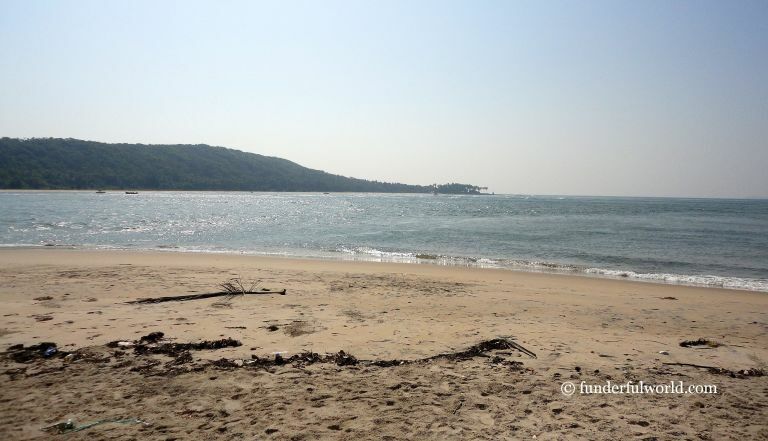 For a different setting, we headed to Malvan, located about 6 kilometers from Tarkarli. Here, we visited the Rock Garden and found a perfect perch among the rocks to view a spectacular sunset. Our eyes darted between the hues in the sky and the activity of a group of crabs on the rocky shore. Crab-watching had now become a daily affair. Always up for a beautiful sunset. Rock Garden, Malvan, India. Late one morning, we drove to the Karli River Sangam at Devbaug, about 8 kilometers from Tarkarli. The road leads to a narrow stretch of land separating the river and the sea. 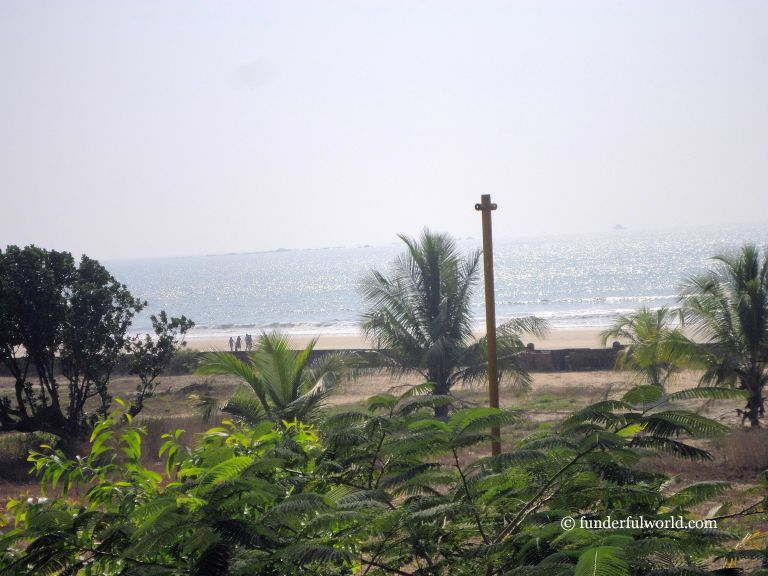 We followed a State Transport bus all the way to Devbaug, to the very tip, where the Karli river meets the Arabian Sea. A special rendezvous. At this place, boat operators beckon tourists to take rides to the Tsunami Island, and to participate in water sports and other activities. We preferred to walk along the stretch of sand at the tip of the land where the river flows into the wide sea. Although the location was picturesque, the heat was gradually becoming unbearable. And so we walked briskly, clicked some pictures, and hurried back to the car. If you’d like to spend some time here, I’d recommend choosing a cooler period of the day. Waiting to head out. Karli River Sangam, Devbaug, Maharashtra. Rendezvous. River Karli with the Arabian Sea. Karli River Sangam, Devbaug, Maharashtra. 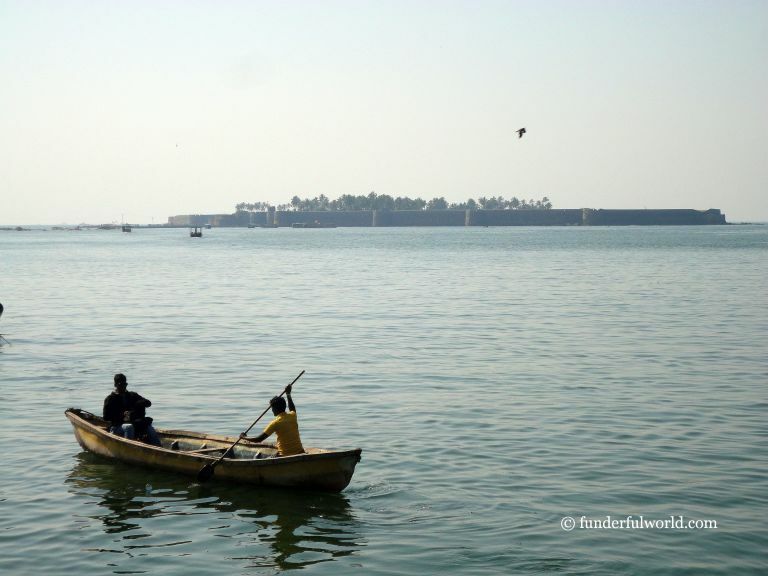 As we headed out of Tarkarli, rejuvenated and in high spirits, we stopped briefly at Malvan for a glimpse of the majestic Sindhudurg sea fort from the shore. 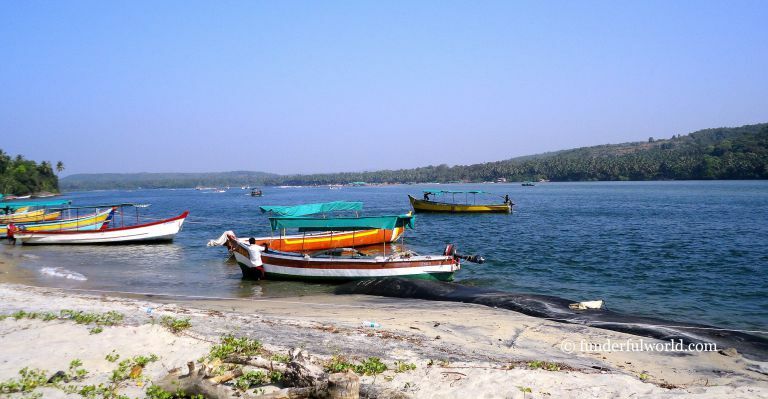 Boats of all sizes and colors journeyed back and forth between the Malvan shore and the rocky island that houses the strong fort. 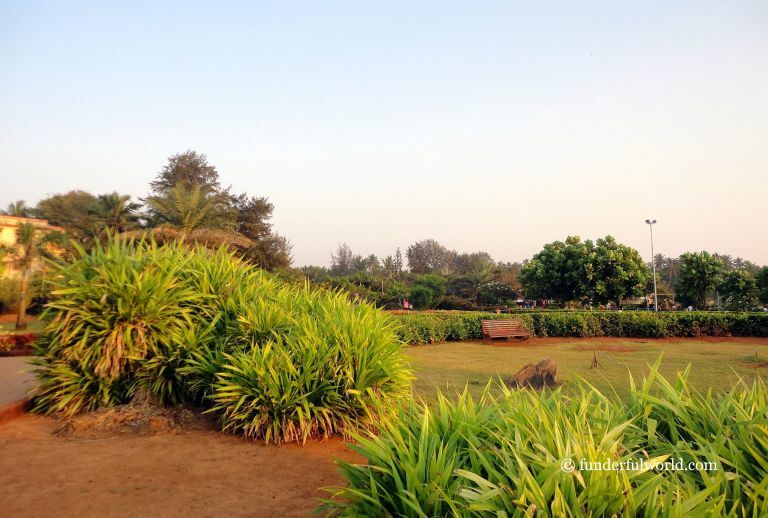 We let our thoughts wander, imagining the buzz at this strategic location during Shivaji Maharaj’s reign. Did the twin fort of Vijaydurg resemble this one? We would find out another time. Rugged and resilient. Sindhudurg, Malvan, Maharashtra. Setting out. 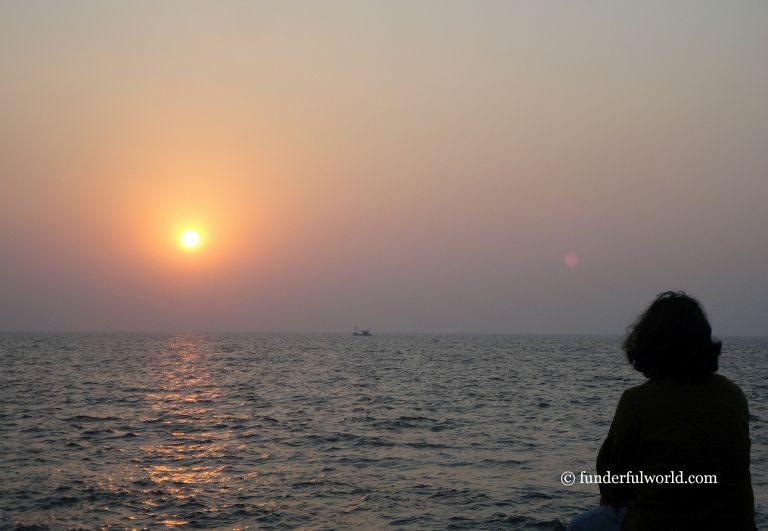 Toward Sindhudurg from Malvan. Maharashtra. For now, it was time to follow the road to our next destination, Vengurla. Tarkarli offers options to participate in numerous water sports such as snorkeling, scuba diving, and parasailing. 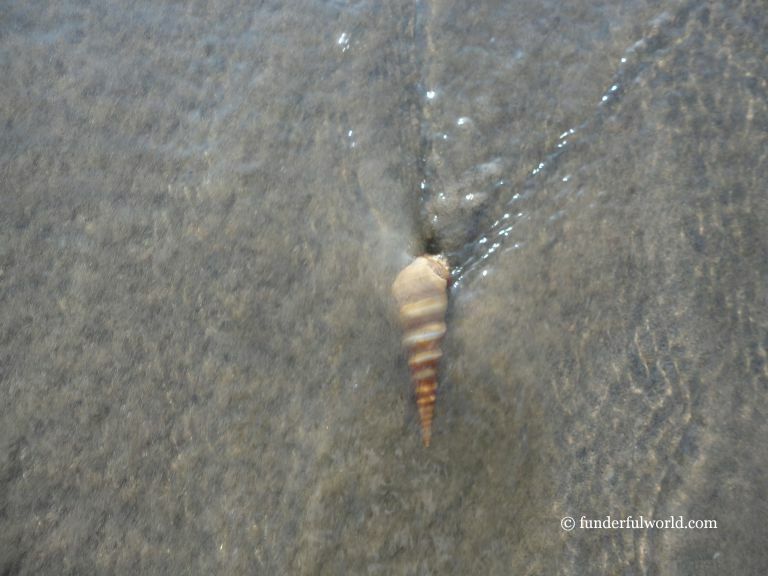 Although these are popular with tourists, we preferred to spend time on the beaches. We drove from Pune to Tarkarli via Kolhapur. Our preference for slow travel prompted us to opt for an overnight stay at Kolhapur.